Holds the values parsed from an HTTP reply status line. Definition at line 27 of file StatusLine.h. Definition at line 23 of file StatusLine.cc. References NULL, Http::ProtocolVersion(), and Http::scInternalServerError. Referenced by HttpReply::clean(), and Http::StatusCodeString(). Definition at line 17 of file StatusLine.cc. References NULL, Http::ProtocolVersion(), and Http::scNone. Referenced by HttpReply::init(), and Http::StatusCodeString(). Definition at line 46 of file StatusLine.cc. References Packable::appendf(), assert, debugs, AnyP::ProtocolVersion::major, AnyP::ProtocolVersion::minor, AnyP::PROTO_ICY, protocol, reason(), status(), and version. Referenced by HttpReply::packFirstLineInto(), HttpReply::packHeadersUsingFastPacker(), status(), and Http::StatusCodeString(). Definition at line 75 of file StatusLine.cc. 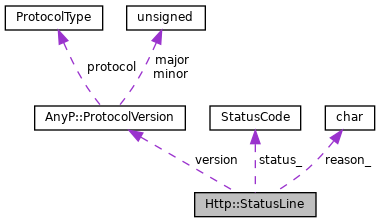 References String::caseCmp(), String::cmp(), debugs, AnyP::ProtocolVersion::major, AnyP::ProtocolVersion::minor, AnyP::PROTO_ICY, protocol, Http::scInvalidHeader, String::size(), status_, version, and xisdigit. Referenced by HttpReply::parseFirstLine(), status(), and Http::StatusCodeString(). Definition at line 40 of file StatusLine.cc. References reason_, status(), and Http::StatusCodeString(). Referenced by packInto(), peerDigestFetchReply(), Adaptation::Ecap::StatusLineRep::reasonPhrase(), status(), Http::StatusCodeString(), and Ftp::Server::writeErrorReply(). Definition at line 42 of file StatusLine.h. Definition at line 30 of file StatusLine.cc. References AnyP::PROTO_HTTP, protocol, reason_, status_, and version. Referenced by Http::Stream::buildRangeHeader(), Http::Tunneler::handleResponse(), HttpReply::httpMsgParseError(), Ftp::HttpReplyWrapper(), HttpReply::make304(), Http::One::Server::processParsedRequest(), HttpStateData::processReplyHeader(), HttpReply::redirect(), HttpReply::setHeaders(), CacheManager::start(), Adaptation::Ecap::StatusLineRep::statusCode(), and Http::StatusCodeString(). Definition at line 45 of file StatusLine.h. References packInto(), parse(), reason(), and status_. Referenced by Auth::UserRequest::AddReplyAuthHeader(), asHandleReply(), HttpReply::bodySize(), Http::Stream::buildRangeHeader(), clientReplyContext::buildReplyHeader(), Adaptation::Icap::Launcher::canRepeat(), FwdState::complete(), Adaptation::Icap::Options::configure(), HttpReply::configureContentLengthInterpreter(), HttpReply::contentRange(), ErrorState::ErrorState(), esiBufferRecipient(), ESIContextNew(), HttpReply::expectingBody(), Adaptation::Icap::Xaction::finalizeLogInfo(), Adaptation::Icap::ModXact::finalizeLogInfo(), Ftp::Server::handleDataReply(), clientReplyContext::handleIMSReply(), HttpStateData::handleMoreRequestBodyAvailable(), Http::Tunneler::handleResponse(), HttpReply::hdrCacheInit(), Client::maybePurgeOthers(), mcast_encode(), netdbExchangeHandleReply(), packInto(), Adaptation::Icap::ModXact::parseIcapHead(), peerDigestFetchReply(), peerDigestSwapInHeaders(), clientReplyContext::processConditional(), clientReplyContext::processReplyAccess(), clientReplyContext::processReplyAccessResult(), HttpStateData::processReplyHeader(), store_client::readBody(), reason(), FwdState::reforward(), HttpReply::removeIrrelevantContentLength(), HttpStateData::reusableReply(), clientReplyContext::setReplyToReply(), Adaptation::Ecap::StatusLineRep::statusCode(), storeLog(), and StoreEntry::validLength(). By rights protocol name should be a constant "HTTP", with no need for this field to exist. However there are protocols which violate HTTP by sending their own custom formats back with other protocol names (ICY streaming format being the current major problem). Definition at line 68 of file StatusLine.h. Referenced by clientReplyContext::buildReplyHeader(), clientReplyContext::cloneReply(), packInto(), parse(), HttpStateData::processReplyHeader(), and set(). Definition at line 77 of file StatusLine.h. Referenced by reason(), resetReason(), and set(). Definition at line 74 of file StatusLine.h. Referenced by parse(), set(), and status(). Definition at line 70 of file StatusLine.h. Referenced by HttpReply::bodySize(), Http::Stream::buildRangeHeader(), clientReplyContext::buildReplyHeader(), clientReplyContext::cloneReply(), HttpReply::hdrCacheInit(), packInto(), parse(), HttpStateData::processReplyHeader(), set(), and Adaptation::Ecap::StatusLineRep::statusCode().